'S e slis thana thioram de bhuntàta a tha ann am brisg. Bha a' chiad iomradh air brisgan ann an The Cook's Oracle le William Kitchiner ann an 1822. Stèidhich Golden Wonder, companaidh brisg, ann an Dùn Èideann ann an 1947 ach dhùin am factaraidh Albannach aice mu dheireadh ann am Broxburn ann an 1987. Ann an Alba tha Mackie's Crisps ann an Siorrachd Pheairt nise a' dèanamh brisg. 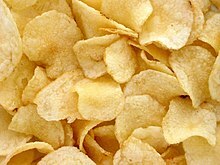 ↑ “Crisps buoyed Britain in its darkest hour” (Beurla). Daily Telegraph. Air a thogail 26mh dhen Iuchar 2016. ↑ “Golden Wonder Factory, Broxburn. Oral Answers to Questions — Scotland – in the House of Commons at 12:00 am on 11th March 1987.” (Beurla). They Work For You. Air a thogail 26mh dhen Iuchar 2016. ↑ “Get in touch” (Beurla). Air a thogail 26mh dhen Iuchar 2016. Air a tharraing à "https://gd.wikipedia.org/w/index.php?title=Brisg&oldid=520069"
Chaidh an duilleag seo a dheasachadh 26 dhen Iuchar 2016 aig 20:24 turas mu dheireadh.